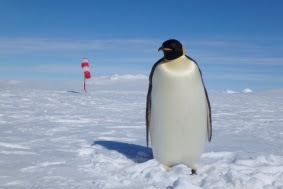 Yesterday Oceanwide Expeditions, a polar cruise operator for over 25 years, reached the remote emperor penguin colony on Snow Hill Island for the second year running. Using the helicopters staged aboard its vessel Ortelius, Oceanwide flew passengers to this rarely visited Antarctic location, then led small hiking groups toward the site – one of the largest breeding colonies of the world’s most iconic penguin species. Since Snow Hill Island is usually inaccessible, this momentous event (which comes just in time for our 25th anniversary) bodes well for our 2019 voyages to Antarctica’s great Weddell Sea.